The Apapa Area Command of the Nigeria Customs Service (NCS) on Monday said that it has granted a total of seven thousand, nine hundred and twenty- eight (7,928) provisional release of containers trapped during the hand over of the Destination Inspection Scheme by the Service Providers. The Command also said that a total of Seven thousand and eighty-seven (7,087) Pre-Arrival Assessment Reports (PAARs) has been transmitted by the Service since the take over of the Destination Inspection Scheme from the Sevice Providers by the Nigeria Customs Service. The Customs Area Controller of the Command, Comptroller Charles Edike who made this known while playing host to the visiting Secretary General of the World Customs Organization (WCO), Mr. Kunia Mikuriya at the command’s headquarters at Apapa, Lagos also disclosed that a total of one thousand, nine hundred and fifty-two (1,952) SGDs had been perfected during the same period. Edike told the visiting Secretary general that at the inception of PAAR, the service was inundated with some teething problems but was quick to add that those teething problems encountered during the period were being surmounted as the service now transmit between nine hundred (900) and one thousand (1000) PAAR on daily basis at the customs headquarters. He recalled that on the eve of the hand over of the Destination Inspection Scheme, the Service Providers dumped over ninety-nine thousand (99,000) form M at the portal of the Nigeria Customs Service which the Comptroller General of customs quickly issued a circular authorizing a provisional release which he said was self assessing. According to him,” with a circular giving the importers and agents rooms for self assessment using Form M value, using the final invoice to assess themselves and to apply to Customs Area Cvontrollers for provisional release and that eased the tension and so importers and agents were applying for provisional release and based on that, we now cleared all the backlogs”. He informed that he joined the Customs in 1984 and all the while he had been a customs officer, core customs duties were being handled by private operators until now when for the first time the customs had fully taken over the customs clearing procedures and trade facilitation describing that as a no mean achievement. The Customs boss attributed the takeover of the Destination Inspection Scheme to a visionary and transformational leadership of the Comptroller General of Customs, Alhaji Dikko Inde Abdullahi who he said had shown direction and leadership since mounting the saddle as the Comptroller General of the Service. He therefore assured the Secretary General of WCO that the Destination Inspection Scheme would succeed under the Comptroller General Dikko as according to him,” Nigeria Customs Service is more than able to steer the ship of PAAR and the Nigerian trade hub to a safe destination”. On his part, the Comptroller General of Customs, Alhaji Dikko Inde Abdullahi who was represented at the occassion by the Deputy Comptroller General, Akinade Adewuyi thanked President Goodluck Jonathan for allowing the Nigeria Customs Service to take over the Destination Inspection Scheme at the expiration of the contrcat of the Service Providers. Adewuyi as well thanked the Management and officers of the Nigeria Customs Serivce for giving their support to the Comptroller General of Customs to make the transition a success saying that without their support, they wouldn’t have achieve all they had achieved. Adewuyi who was a former Customs Area Controller of the Command further appreciated the efforts of the current Area Controller, Charles Edike who he said has brought a lot of changes to bear on the command both in terms of physical structures and in revenue being generated by the command. The Customs Chief disclosed that they invited the Secretary General of the WCO for him to come and see for himself how far Nigeria Customs Service had gone in the transformation drive. While welcoming the Secretary General, he admitted that the Customs were faced with a lot of problems inm an effort to transmit to PAAR but expressed hope that the problems would be surmounted in a very short while. Responding after listening to the contributions made by the stakeholders at the visit, the Secretary General, World Customs Organization (WCO), Mr. Kunia Mikuriya expressed happiness over his visit to Nigeria saying that within the little time he had spent on arrival, he has come to witness a lot of transformation going on in the Nigeria Customs Service. 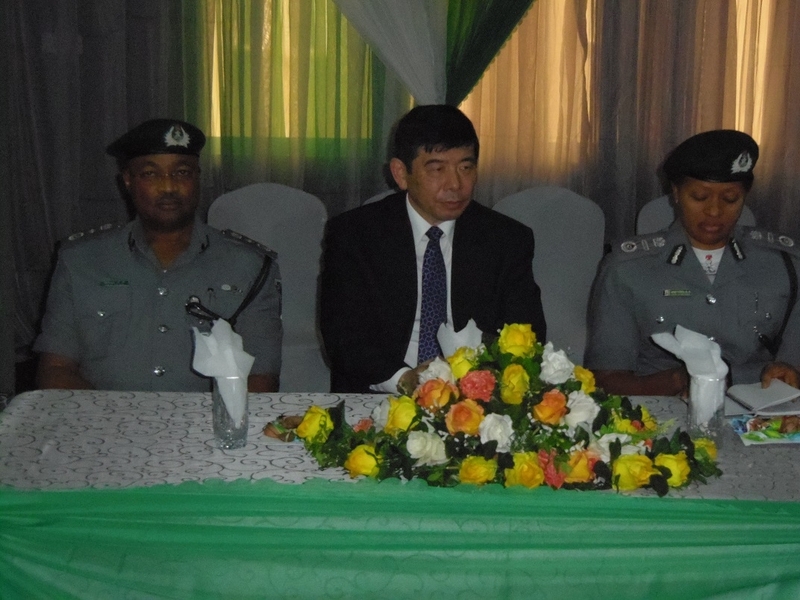 Mikuriya observed that from the responses he gathered from the interaction with the stakeholders, he noticed that all of them were supportive of the take over of the Destination Inspection scheme by the Nigeria Customs Service which he said was the trend all over the world. He underscore the importance of communication and dialogue to the success of any customs formation accross the globe advising the Nigeria Customs Service to always share information and engage in constant consultation with their stakeholders even as he added that in as much as they maintain communication with big businesses, they should also extend same to small and medium businesses. “Nowadays, almost all the ports accross the world are buying for competitiveness and to get that competitiveness, there are several elements amongst which are infrastructure and the diversification of Production. Another important thing is about the border procedure, how efficient it is. This is why I can feel your shared enthusiasm of making the port of Apapa to be the premier port and increase the competitiveness and connectivity because nowadays, even in the global supply chain and for the global supply chain to participate in the global economy, what is important is to ensure this connectivity”. “And I always say that Customs should be the agent of connectivity, of course in close partnership withthe business. This is why I really cherish your comments and suggestions”, Mikuriya said. He called on the customs to put the machinery in motion towards identifying the compliance traders while collaborating with other government agencies to tackle the menace of hazardous waste being imported into the country from their country of origin with a v iew to placing appropriate sanctions on the offending vessels. He further harped on the need to reduce the human interface between customs and businesses calling for the adoption of the modern information communication technology in this regard.